* Note, if you are reading this anywhere but on my blog, please click through to submit your entry. Thanks! "You think that's big? You should see the one that got away!" 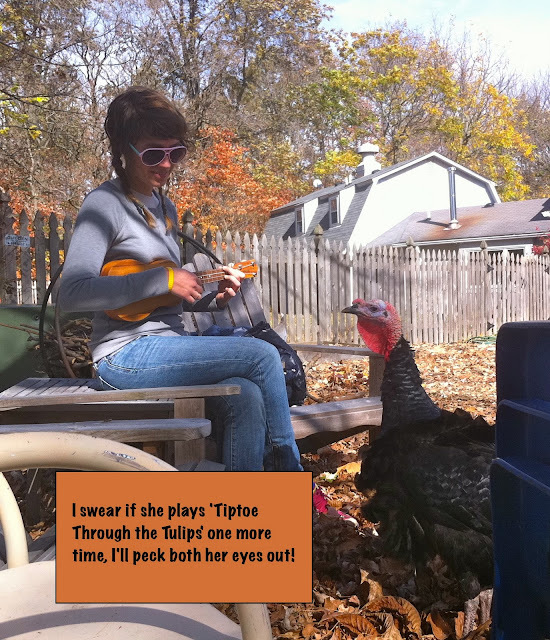 hahahaha...that turkey pic is HILARIOUS. And holy hugesness on that turnip!!!! Wow! A turnip as big as your head! Our sweet potatoes tend to be that big; we joke about playing football with them (you could kill the other player with one). Yay, momofserra, for giving John a run for his money! You guys are awesome. Teresa, You don't get a vote. You only get to PLAY. :D Your last one was awesome and you have a few days to think "turnip". Your sweet potatoes sound incredible, btw. "OK, here's the plan: I'm going to sit here looking cute, pretending this turnip is a rocket ship. You go find the cookies." Look, Mommy! I found one of those Mandake cweatures from Harry Totter!